The Factory was created to bring together the best services and products for home and commercial building projects. We love the opportunity to collaborate on projects, helping builders, interior designers and homeowners achieve their design and build vision. 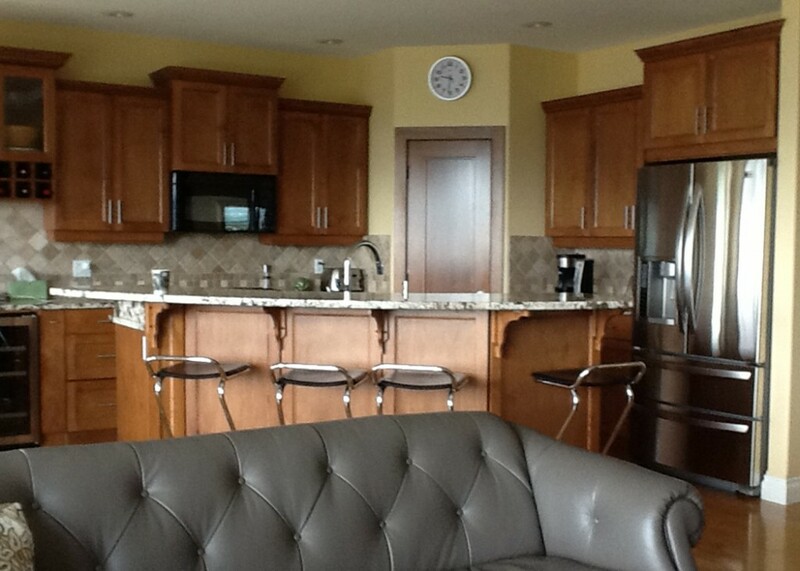 Three Factory companies recently completed a beautiful kitchen renovation in Upper Mission, Kelowna. Designed by Laura Cruse from V6B Design Group, “Transitional Contemporary” is an example of collaboration and excellence. To design and build a contemporary kitchen with improved usability, understated storage and integrated appliances. 1. Wall hood range: Mounting it without 10″ long stainless tube to make it look built-in. 2. 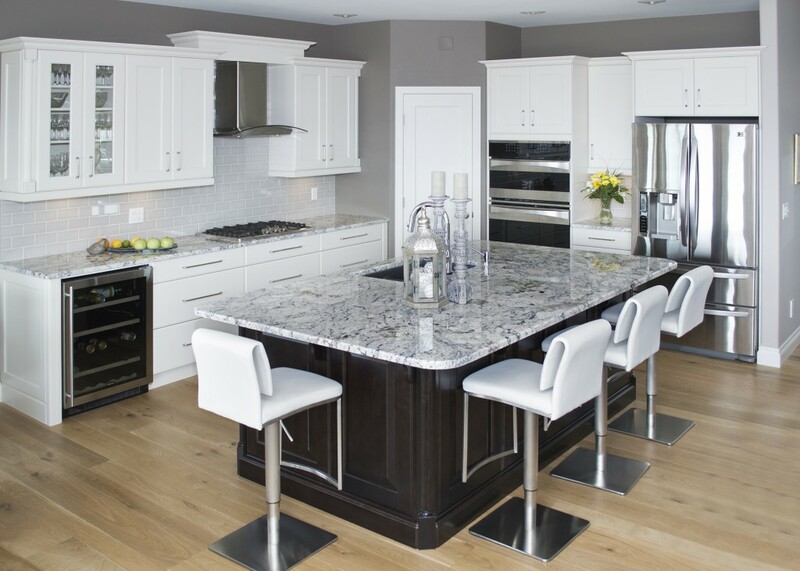 Island: Making it look like furniture with seating and hidden storage. 3. Walk-in pantry: Integrating it with overall design. 4. Balance: Creating storage space with integrated appliances. 5. Details: Ensuring white and dark components have matching and complimentary details. Innotech Windows + Doors‘ showroom at The Factory is a central location for building professionals and homeowners building throughout BC’s Southern Interior Region, including the Thompson Okanagan and the Kootenay Rockies. The Ridge is a sustainable house that looks like it is suspended in the trees. 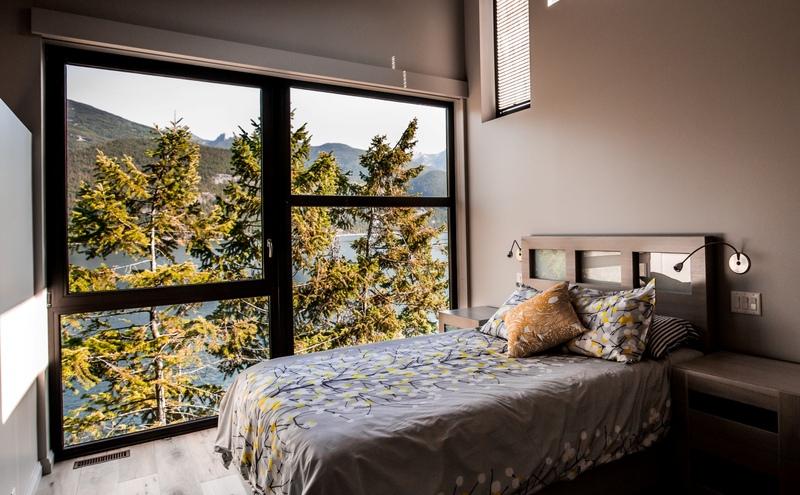 Located in Kaslo, BC, the home is perched on a cliff overlooking Kootenay Lake. Designed around many of the original trees on the property, the home features many large Innotech windows and doors that provide stunning views of the lake and mountains. V6B Design Group collaborates with design professionals from around the world to help design and build award-winning spaces. 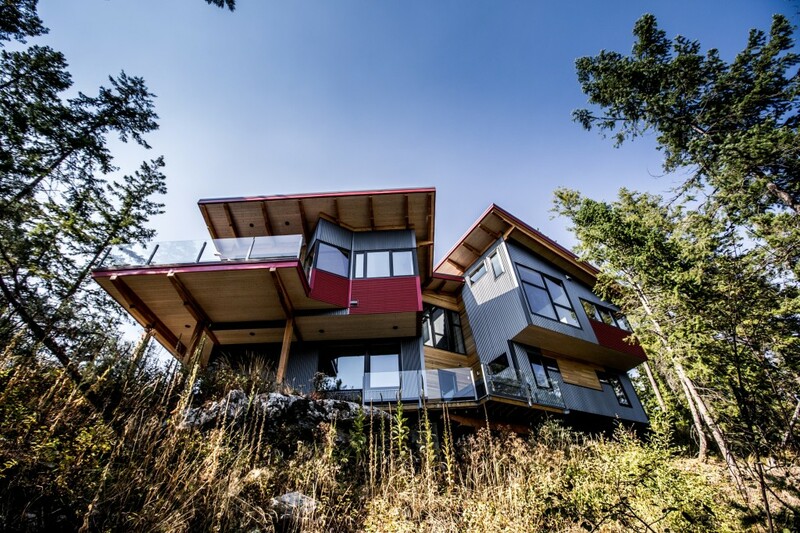 Recently, V6B worked hand-in-hand with their Vancouver Island design affiliate Design Details to design a contemporary and sustainable home in Qualicum Beach. 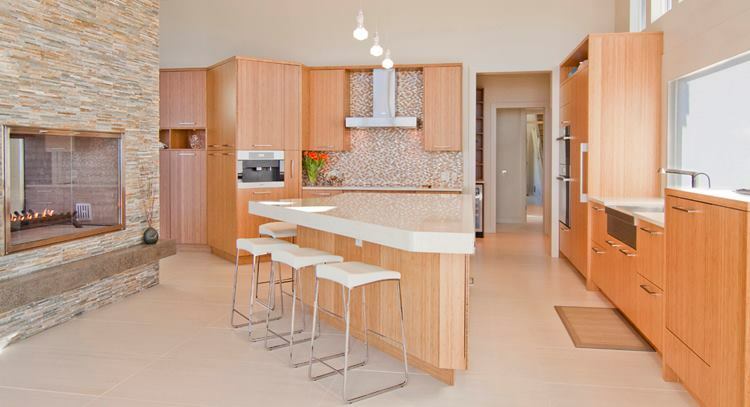 Whether you’re a homeowner or an established Okanagan design professional, Laura Cruse at V6B Kelowna can help you push your design boundaries to design and build a home that exceeds your vision. When The Factory was is its conceptual stages, founder Bo Snarski envisioned a creative space where synergy would thrive. 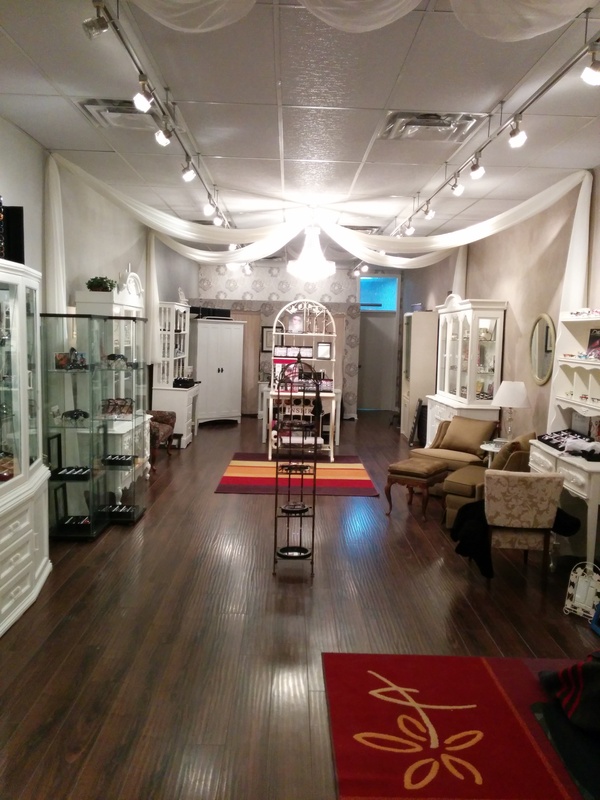 In this recently completed renovation of Inspired Eyes Creative Eyewear in Kelowna, his vision is now a reality! 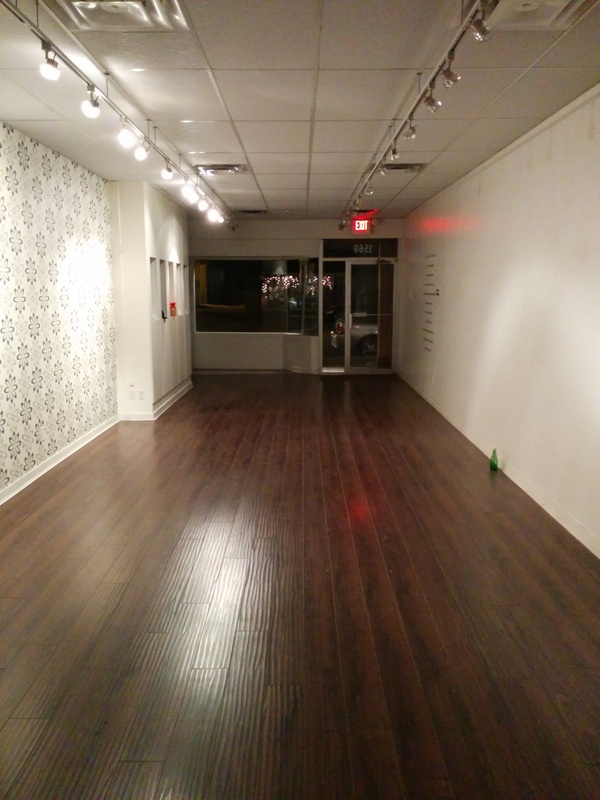 V6B Design Group and Claymasters joined forces in the renovation of the new retail location for Inspired Eyes Creative Eyewear located in Downtown Kelowna. Laura Cruse from V6B consulted on the concept and planning of the space, helping owner Lana Belvis create a chic space with a distinctly Versailles-inspired theme. From the Inspired Eyes’ colour palette, decorative ceiling treatment to its furniture placement, Laura created an inviting space with hints of luxury and loads of French charm. Gerry Monty of Claymasters executed the atmosphere-setting clay wall. Made from non-toxic American Clay in “Capital Lake”, the unique feature wall offers a natural textured finish reminiscent of old French castles – the perfect complement to the space’s subtle glamour. 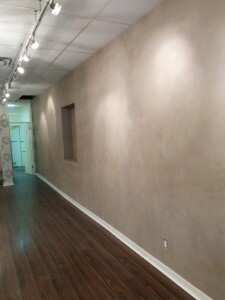 The completed clay wall. We love the texture! 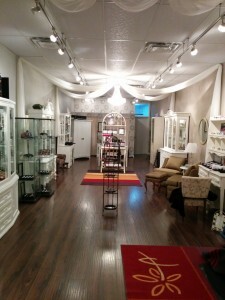 Thank you to Laura and Gerry for working together to create a stunning space for Kelowna’s newest eyewear retailer! For more photos, take a look at the photo album on The Factory’s Facebook page.